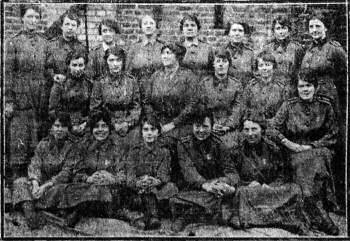 The Womens Legion was raised by Lady Londonderry, and first commenced duties on 3rd August 1915. Their initial task was to supply cooks to the New Army, but later they were employed on other tasks. When the WAAC was formed in 1917 the cooking and General Services Sections enrolled in it, but the Motor Transport Section continued overseas until 1919. "The group of girls depicted above belong to the Women's Legion, and went to France on May 5th 1917, in charge of Miss Campbell (seated in the centre of the second row). They were the first girls to cook for "Tommy" in France. Upon the left of Miss Campbell is Miss B. Hamblen, daughter of Mrs Hamblen of 4, Forest Lane. Before joining the Legion Miss Hamblen was employed in the bakehouse at Le Riche's Stores." Many women went to work in munitions factories in England. The work was unpleasant, dangerous and unhealthy but women were encouraged by relatively good pay and the knowledge that they were "doing their bit" by releasing men to go to the Front. Miss Dorothy Nicoll of Guernsey was twice decorated for her bravery in "incidents" (ie explosions) in munitions factories. Unfortunately few medal rolls for munitions workers are in existence. 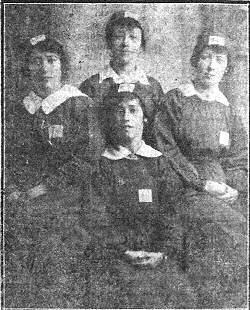 The picture below shows a family of Guernsey women who all volunteered for munitions work. "Our photograph shows four daughters of Mr J Coutu of 6, Allez Street all of whom are employed in various kinds of munitions work in England. Seated in front is Miss Gladys Coutu, the others from left to right are Miss Edith Coutu, Mrs Gillingham (née Lilian Coutu) and Miss Aline Coutu."